The director of a bus company has been banned from running public transport services after he shut down his firm without warning. 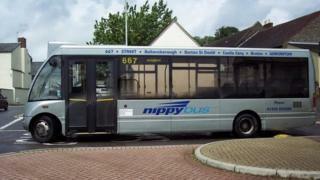 Sydney Hardy closed Nippy Bus - which ran public services in Somerset - on 29 October, telling staff in a memo to "consider themselves dismissed". Writing to the Traffic Commissioner, Mr Hardy cited driver shortages and the difficulty of running rural services. The Traffic Commissioner said Mr Hardy had shown "contempt" for all concerned. An internal memo sent by Mr Hardy on 29 October told staff: "I am quitting to pursue my dream of not having to work here. "I have had enough and realise I cannot work with you, the people I employ, a moment longer." An inquiry into Nippy Bus by the Traffic Commissioner for the West of England said Mr Hardy was "perfectly entitled" to bring his operation to an end but the law required 56 days' notice of changes or cancellations to registered bus services. The inquiry noted that 19 prohibition notices had been issued for maintenance issues on Nippy buses in the last five years. The commissioner said Mr Hardy's letter explaining the closure, dated 25 October but received on 31 October, said: "Whilst I will be left with personal debt due to director's personal guarantees that will cost me everything I own and more, at least I know I will never have to work in this industry again." Concluding, the commissioner said: "Mr Hardy showed utter contempt, not just for his staff who were laid off with no notice, but also for the community which he served." Mr Hardy has been disqualified from holding an operator's licence or running a licensed company for 10 years.